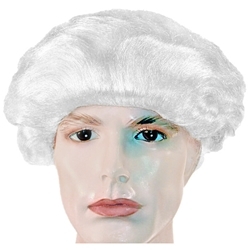 This wig features an elastic band for a comfortable and secure fit to almost any head size and is available in white. The colonial bob wig was a very popular 18th-century men's style. It is meant to be a powdered look. Unlike most colonial wigs, this one does not have a ponytail.